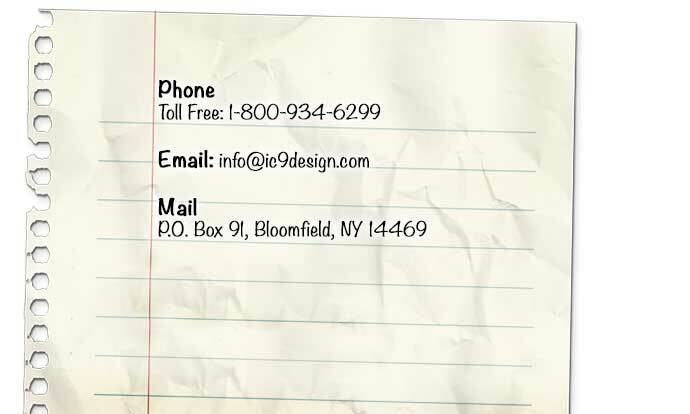 IC9design is the professional "go-to" team for business-related web and print work. Although much of our work is completed on a regular hourly rate or estimate, we are often hired on as the creative department through the use of a monthly retainer. That means we're here whenever you need us. We are a very approachable company with great employees and incredibly creative ideas! Compared to print advertising, internet marketing costs less. Print is 'one-and-done'. Internet marketing can last a whole year and use a wide variety of rich media techniques. Our entire creative team works more on your services and campaigns than one of your full time employees ever could. And with a monthly retainer we cost less than your full-timer. Although you might feel your market is local, how you would feel when you find out the next county, state or country is very interested in what you have to offer. Giddy? Yeah we thought so. IC9design is heavily engrained in this digital age. We're your team for everything web related; websites, email blasts, marketing campaigns, SEO - we handle it all on your behalf. Our clients have rated us as "exceptional" when it comes to service uptime and support. Our hours are 8 to 5 EST. Our designers and developers are here in the USA to work on your projects.